To preserve the aesthetic and architectural consistency of Kingswood, the Covenants require that any structural or design changes or modifications (including exterior repainting) or additions (including decks, porches, swimming pools, fences, or other structures) must receive prior approval from the KHA Board’s Architectural Review Committee. Please allow up to two weeks for review after it is received. 2. The work proposed. It is important for us to picture how it would look when complete, so supporting documents are required, such as photos of paint colors / fence samples / shingles / etc., or weblinks to photos, along with plot plans, elevations and any other details. 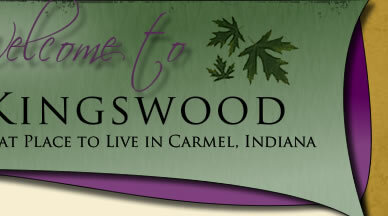 Carmel Indiana Fence Regulation - please review before requesting fence approval. Please know the HOA board cannot approve a fence in an easement. The City of Carmel must be contacted. Does your mailbox need to be replaced or spruced up? The provider for the approved mailbox is Otto's Streetscapes Solution, Greenwood, 317-886-4400 or toll free at 877-55 POSTS. Need to touch-up the mailbox post? At Porter Paint, 210 W. Carmel Drive, ask for "Kingswood Caparelli Beige". This is a custom color. It is helpful to have the following quart formula, just in case. Formula: B-40, C-36, F-5+1/2, W-12. Porter Paint offers Kingswood Homeowners a discount on the quart price making it $15. Just mention that the paint is for your Kingswood mailbox post. Add an extra shine and maintain the integrity of the color by using automobile paste wax and polish your mailbox. You will be surprised at the difference it makes!